I must profess that I had not heard of Haruki Murakami until about a year ago, though he has been known in literary circles for quite some time. Furthermore, up until this review, I had not finished any of his books that I own. That will likely change now that I’ve had the pleasure of reading his memoir on running. 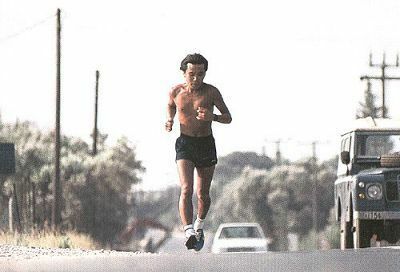 What makes When I Talk About Running such a beautiful work of art is that Murakami masterfully blends his experience as a writer with his experience as a runner. The memoir is just as much about writing as it is about his enthusiasm for the hobby of running, but at no point should someone looking for a memoir on running feel short changed, as the narrative isn’t haphazard and by the end of short novel you’ll wonder why you had never thought of writing and running in the same way before. While I hate to use the following comparison because I feel as if it is overused, Murakami has a delightful Hemingwayesque way of presenting his story both in times of humor and in times of reflection. Furthermore, Murakami is full of clever soundbites as he extols wisdom, not in a pretentious way, but as more a personal realization after careful thought. Without wanting to sound hyperbolic, it’s enlightening and teeters on being Buddhist in thought. Such a statement borders on heartbreaking until you realize the peace at which Murakami is with this apprehension. At many points he is unashamed with how age has impacted his physical potential. His humility and humor that will follow such gorgeous lines often draws the reader into picturing Murakami as if he’s in the room with us having a casual conversation. It’s disarming in a way that allows you to understand him without having to break through barriers of deciphering what he means. It’s precise, but always casual. And so, while there may not be a concrete plot that runs through Murakami’s novel, there’s enough of a thread that moves time along to get us to the author’s next accomplishment, defeat and everything in between. Whatever happens at any point within the story, you won’t be disappointed. Every page is a rare gift that ends as soon as it begins.